Industry specific products include electrical equipment for medical devices, automotive and transportation, and basic consumer products. The EMC Shop will help pinpoint the required test equipment for certifying or evaluating your product in order to obatin certification. Product Standards There are no products in this category. EN 50121 describes the Characteristics of Railway Systems that affect the electromagnetic enviroment. The EMC Shop stock a wide range of immunity and emissions EMC test equipment for satisfaction of Product Standards - EN 50121. This standard applies to all electronic equipment for control, regulation, protection, supply, etc., installed on rail vehicles and associated with: - either the accumulator battery of the vehicle; - or a low voltage power supply source with or without a direct connection to the contact system. Surges, Electrostatic Discharge and Transient Burst Susceptibility - related test equipment EN 50155. EN 50370, Electromagnetic compatibility (EMC) for the product family machine tools; immunity and emissions. 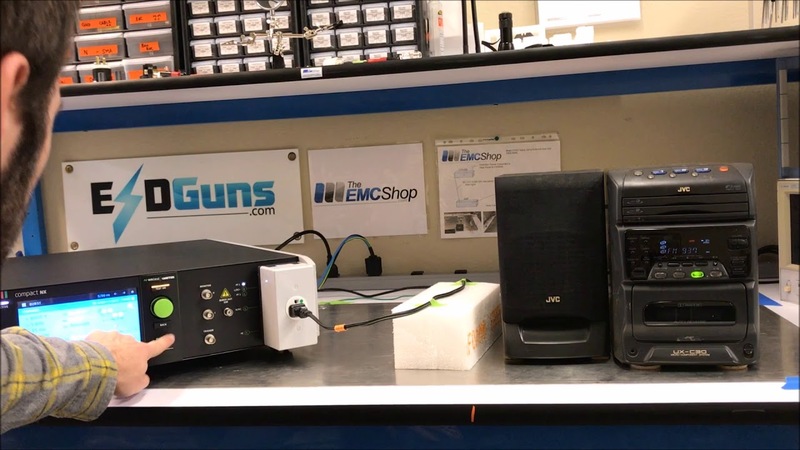 The EMC Shop stocks a variety of multi-function transient generators, coupling/decoupling networks, and more for all your electromagnetic compliance testing needs. EN 55024 is equivalent to CISPR 24 and applies to, as the name implies, information technology equipment (ITE). EN 55024 defines the immunity test requirements for information technology equipment in relation to continuous and transient conducted and radiated disturbances. Tests within the standard include Electrostatic Discharges (ESD), Electrical Fast Transients (EFT), Surge, Power Frequency Magnetic Fields, Power interruptions, Radio Frequency Interference (RFI). EN 60065 applies to electronic apparatus designed to be fed from the mains, from a supply apparatus, from batteries or from remote power feeding and intended for reception, generation, recording or reproduction of audio, video and associated signals. It also applies to apparatus designed to be used exclusively in combination with the above-mentioned apparatus. This standard primarily concerns apparatus intended for household and similar general use but which may also be used in places of public assembly such as schools, theatres, places of worship and the workplace professional apparatus intended for use as described above is also covered unless falling specifically within the scope of other standards. EN 60950 is the Product Safety testing standard for "Information Technology Equipment" (known as ITE). EN 60950 applies to mains and battery powered information technology equipment, including electrical business machines such as computers and office copiers, along with devices for use with telecommunication networks and cable distribution systems. IEC 60601-2-27 applies to electrocardiographic monitoring equipments used in a hospital environment as well as when used outside the hospital environment, such as in ambulances and air transport. 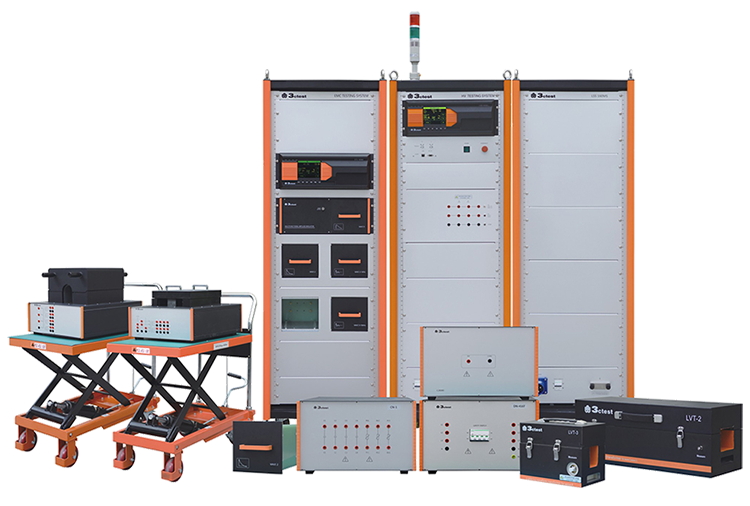 The test equipment supplied to meec IEC 60601-2-27 combines the sine wave generator, high voltage source, switches and resitors as outlined in Figures 201.102/3/4. Transient generators are typically benchtop, but heavy equipment. When doing testing on three phase power lines systems usually require much larger coupling/decoupling networks which substantially increase system size. EM test environments with ground planes with connections to earth are required to safely use transient generators. EFT Coupling Clamp: Required for testing data lined to IEC 61000-4-2. Calibration Adapaters: Used to calibrate or verify EFT generator output. Transducer Plate: Used to calibrate EFT/Burst system at coupling clamp. Test Setup: Test table, coupling clamps, etc. EN 61326 is the European Union’s EMC standard for certain electrical equipment that is involved in control, laboratory use, measurement and test. EN 61326 determines the requirements for emissions and immunity regarding electromagnetic compatibility (EMC) for electrical equipment that operates from a supply, battery or circuit being measured. Measuring relays and protection equipment and the Electromagnetic Compatibility Requirements. IEC 60255 is applicable to measuring relays and protection equipment, taking into account combinations of devices to form schemes for power system protection including the control, monitoring, communication and process interface equipment used with those systems. UL 1449 requirements cover enclosed and open-type Surge Protective Devices (SPDs) designed for repeated limiting of transient voltage surges as specified in the standard on 50 or 60 Hz power circuits not exceeding 1000 V and for PV applications up to 1500 V dc. SPDs are marked with a Voltage Protection Rating (VPR) that is obtained during the Nominal Discharge Current test using a 6 kV, 3 kA Combination Wave Generator.